V. E. Barnett, Kandinsky Watercolours Catalogue Raisonn, Ithaca, New York, 1994, vol. 2 (1922-1944), p. 483, no. 1278 (illustrated). New York, The Museum of Modern Art, Kandinsky Watercolors, April-May 1969, no. 38. Toronto, Art Gallery of Ontario, Kandinsky Watercolors, May-June 1970, no. 39. Bern, Kunstmuseum, Kandinsky Watercolors, May-July 1971, no. 58. Paris, Berggruen & Cie., Kandinsky: aquarelles & dessins, October 1972, no. 47 (illustrated in color). London, Lefevre Gallery (Alex. Reid & Lefevre, Ltd.), Oil Paintings and Watercolours by Wassily Kandinsky, April-May 1973, no. 33 (illustrated in color). The Nazis closed the Berlin Bauhaus in July 1933, and early the following year Kandinsky and his wife Nina took an apartment in Neuilly-sur-Seine, marking the beginning of the artist's final creative phase, his so-called Paris period. 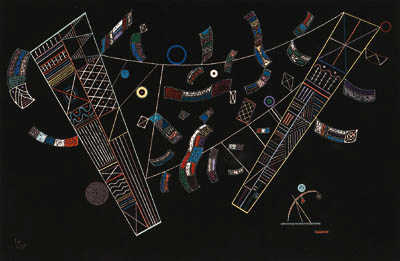 An important characteristic of Kandinsky's late style is his interest in basing his abstract forms on biomorphic shapes, so that they often resemble small deep sea organisms as seen under a microscope. Various publications which Kandinsky may have seen have been proposed, including Ernst Heinrich Haeckel's Kunstformen der Natur, published as far back as 1904. Newspaper and magazine clippings kept by the artist also attest to his fascination with the biological sciences. A second influence on Kandinsky's pictorial vocabulary during this period is his growing acquaintance with the leading figures of the Paris art world, especially the Surrealists and artists associated with that movement. The works of Arp and Mir have often been cited by critics as having had an impact on Kandinsky's painting after 1934. Although the artist was quick to play down the extent of this influence -- he was not drawn to the Surrealist conception of the subconscious, automatism, myth or dreams -- he clearly absorbed their ideas in a manner that is entirely his own.